put your amazing slogan here! Like the Booligan Airsoft Facebook page for a chance to win gear, guns, and other cool stuff! Deep Fire is a Hong Kong based airsoft manufacturer who makes very high quality internal parts, as well as AEGs, accessories, and various other weapons, like grenades and launchers. They are starting to branch out more in the US and get information about their various products out to players, which brings us to our review today. 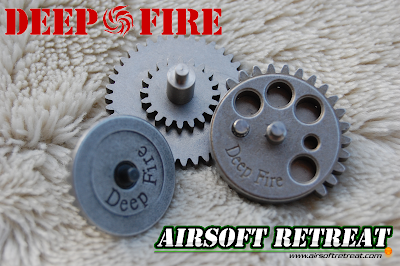 Deep Fire sent ASR a titanium V2/3 gear set, in order to have it reviewed here on Airsoft Retreat, so read on for more information on this high quality gearset! As mentioned before, the gear set was shipped to me directly from Deep Fire. Their products can be found at most major airsoft retailers, especially Airsplat, however, the gears are a little hard to find in the US. I was able to locate them at Redwolf, where they are priced at $77, putting them cheaper than most gears by Systema, Prometheus, etc. I expect to see these gears in more US based shops soon, due to Deep Fire's commitment to increased US sales and support. This gear set is constructed out of titanium, which is renowned for its light weight, high strength, and high crack and corrosion resistance. Arguably, these characteristics are what makes it a great material for AEG gears, and Deep Fire is pretty much the only major manufacturer to go this route. The gears being reviewed today are standard torque/speed ratio, making them good replacement gears for mid level FPS guns. They are designed to be used in V2/3 gearboxes, or other gearbox versions which are compatible with V2/3 gears. Deep fire packaged the gears in a clear plastic package with a foam insert to keep everything protected during shipping. My package was sent to me using Hong Kong Post, so it survived a long plane ride without any damage. My first thoughts when I looked at the gears were that they were well manufactured, with no visible defects that I could notice. The gear design itself is fairly plain, following the standard layout as most other V2/3 gears, however, the difference is in the construction materials used, as well as the overall quality. As mentioned previously, the gears are made out of titanium, and they did feel slightly lighter than normal steel AEG gears. My scale will not weigh accurately at these low weights, so I cannot do a direct weigh in of the gears. The overall construction looks good, with no burrs or other casting defects that I could see with my bare eyes. Really, there's not too much I can say about the gears themselves, so instead, let's jump right into the testing portion of the review. The gun is currently shooting right at 420 FPS @ 23 RPS on 11.1v Kong Power LiPo battery. I installed the gears, which is an easy process due to the split gearbox, and gave them a quick break-in run without the upper gearbox in place. I recommend doing this on ALL gears, as, in theory, it helps compress the metal at the contact points on the gear faces, as well as get rid of any tiny defects that you may not be able to see. It is important to do this without a spring/piston installed, as you will be running the gears together with pretty much no stress from other components. Once shimmed, broken in, and a small amount of silicone lubricant applied, I went about beating up the gears as best as I could. My first test was to install the upper gearbox, and see how everything was firing. After tweaking the motor height a bit, I was able to get it shooting to my liking. First thing I noticed was that the gears were a little bit louder than the stock ICS units, which is something I had heard about with these gears when used in ICS guns. Once I got it firing well, I proceeded to dump a 300 round hi-cap through the gun, only stopping once to re-wind the magazine. It took that abuse without any change in firing sound, or visible damage to the gears. The next test I did was to leave the gun outside during freezing temperatures (about 29 degrees for the overnight low) and as soon as I woke up, I ran two 100 round mid-cap magazines through the gun in 15-20 round bursts. Again, there was no visible damage to the gears, and the gun was still firing great. After the basic torture test, I did a few hours of plinking and target practice, putting another two hi-cap magazines through the gun, giving me about 1000 rounds on the gears, with no problems. Obviously, time will be the ultimate deciding factor in how durable these gears are, but so far, I'm really pleased with how they took my abuse. Gears are necessary to make your AEG run, and these Deep Fire Titanium gears are great upgrade or replacement parts. It would be nice to have them available in other ratios, for higher performance, but these are great components for increased durability with moderate spring upgrades. Keep an eye out for these gears at an airsoft retailer near you! Many thanks again to Deep Fire, and of course, Airsoft Retreat!